"Microsoft has begun notifying some Windows Phone 7 users that a new security-focused update for Windows Phone 7 is ready for download." 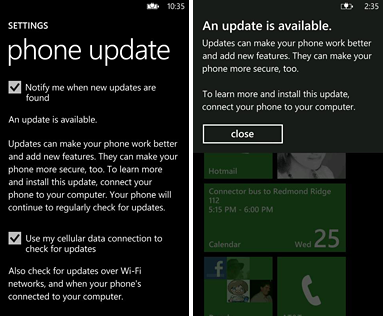 Microsoft is reportedly pushing out the 7932 update for the Windows Phone 7 OS. This update is intended to fix the security problem caused by the bad SSL certificates from the Comodo breach a few months back. This update, as with the two other updates are completed through the desktop client. Maybe we'll get OTA updates soon or at least the ability to choose where to save my device backup. Forcing me to use my C: drive isn't always the best choice, especially when I have limited space on that drive in the first place. I think I'll wait too. Assuming I get notified. With the Focus it seems like there is a really high likelihood of an update going wrong. I spend most of my IE time on Google Reader so the SSL thing doesn't worry me. Worked fine for me on my 'unlogo'ed' Quantum. Didn't see much of a change, tho.